Singapore, 25 February 2009 – 60% of the 2009 FORMULA 1™ SingTel Singapore Grand Prix Paddock Club™ has already been taken up since tickets went on sale on 6 February 2009. Sales of Sky and Club suites have also been brisk with 40% of the available corporate suites already taken up with a number of locations already fully sold or close to sell out. These include the Turn 2 Sky, Turn 1 Sky and Turn 1 Club Suites. 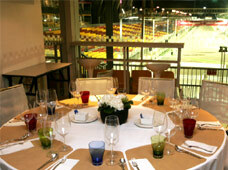 Race promoter Singapore GP Pte Ltd publicly released the corporate hospitality packages on 2 February 2009. The corporate suite packages and Paddock Club three-day tickets range from S$3,388 to S$8,000 (excluding GST) per person. "Given the current economic realities we are greatly encouraged by the very strong support we have received. Suites at the prime viewing locations continue to sell well as their limited number ensures a high level of exclusivity. Additionally, our new lower priced entry level product The Green Room, has proved popular with companies looking to maximise budgets whilst giving their most valuable clients access to the hospitality event of the year,'' said Mr. Darren Chen, Singapore GP's Director for Corporate Sales. SGP has exclusive rights to all corporate hospitality throughout the circuit, and companies wishing to purchase these packages should contact our Corporate Sales Department at +65 6731 5900 or hospitality@singaporegp.sg. Final preparations are under way for the release of general admission tickets, which is expected to be available from end March, with further details to be announced by mid- March. For general information on the event, please visit www.singaporegp.sg.